Posted on June 1, 2018 at 9:26 am. Our new still, Marcellus Wallace, entered our lives in February 2018 taking his place as the heart of our distillery, but his pedigree dates back much further than Deviant Distillery, further back than the invention of sliced bread, even further back than Madonna’s first album. Handcrafted in Portugal from copper sheet Marcellus is a traditional Alembic still with a design that can be traced all the way back to old Moorish traditions. Believed to be the first design of still ever used, the name Alembic is derived from the Arabic al-anbiq, meaning still or ‘that which refines’, and from the Greek ambix, which means cup or pot. These early Alembic stills were made from clay pots and glass tubes but share the same basic components of any modern-day copper-pot Alembic still, with a pot, a swan neck lid, and a condensing unit. 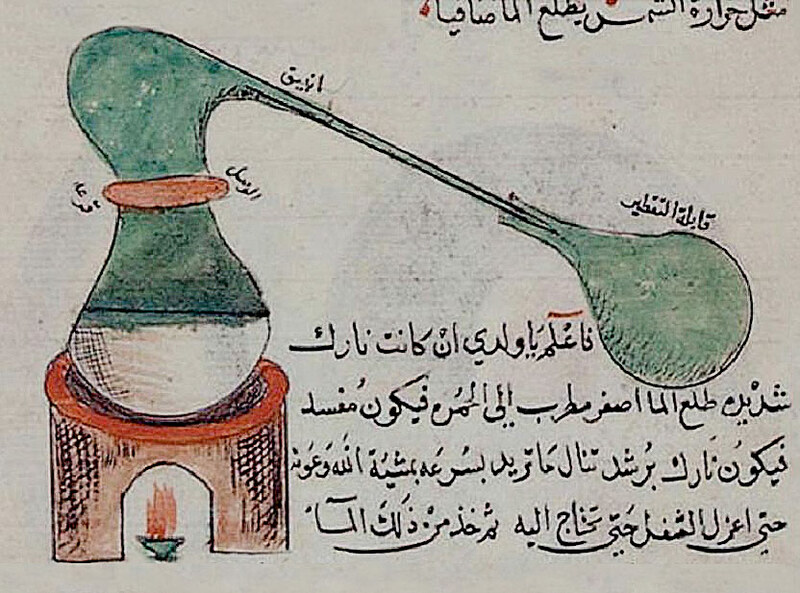 Although the exact origin of stills and distillation remains unknown, Saracena alchemists who conducted some of the first scientific studies on distillation during the middle ages attribute the invention of the Alembic still and its use for purifying alcohol to Muslim alchemists in the 9th century. In particular, Jabir ibn Hayyan who is commonly considered one of the fathers of modern chemistry. However, journalist Fred Minnick, in his book: ‘Whiskey Women: The Untold Story of How Women Saved Bourbon, Scotch, and Irish Whiskey’, claims that an Egyptian woman named Theosebia was the inventor of the Alembic still – although just like Rosalind Franklin recognition for her work was attributed to the nearest man, in this case, her brother Zosimo of Panoplies #womeninscience #feminism. Regardless of its exact origins, just like algebra, toothbrushes and coffee the spread of distillation into Europe unmistakenly arises from the Arabic world. Beginning in Sicily in the 13th century when wine was transformed into what is now known as grappa, then continuing its march West until one fateful day almost a century later a monk in Ireland (or Scotland depending on who you ask) started distilling fermented grain – that’s a story for another day though. Over time as stills and distillation became more commonplace the design was improved, in 1526, Paracelsus used water baths to improve heat transfer. Then in 1771 the German chemist Christian Ehrenfried Weigel invented an apparatus that was later (and mistakenly) named the Liebig condenser, a device that uses flowing water to cool the distillate leading out of the still – this was the forerunner to modern worm-tub and shell-and-tube condensers. As a handmade Alembic still of traditional design Marcellus Wallace incorporates and embodies the history of distillation, the evolution of still design that came before him and the centuries-old practices of hand moulding copper stills in the Iberian Peninsula. Marsellus Wallace provides Deviant Distillery with a millennia-old link to the past as we endeavour to push the boundaries of our craft moving forward, Just like Madonna’s in the 90’s.